We painted the town red upon arriving in Oklahoma City. In other words we got lost and the GPS tracking recorded it all. 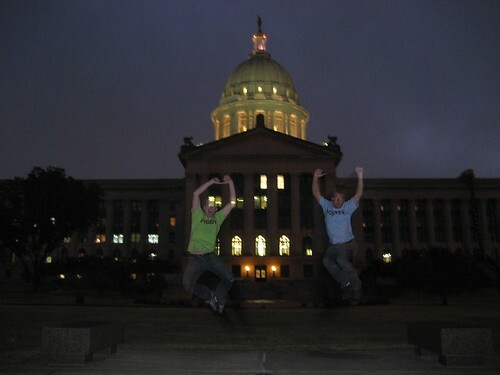 But we finally found the capitol building and got our shots. Capital number 21, day 16. Justin and Brian came and met us in Oklahoma City. After a dinner in the Bricktown district of Oklahoma City we parted ways with Chris and headed to Tulsa. Before we go on lets all pause and thank Chris. He shattered the distance record for all drivers, taking us from Houston to Austin to Oklahoma City. 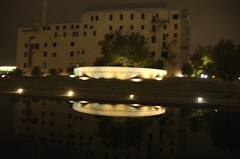 After dinner we went to check out the Oklahoma City bombing memorial. It was an incredibly sobering and moving moment. The memorial consists of 168 eerily beautiful chairs eluminated within trees and grass, set against a large reflecting pool. Each chair representing a victim of the April 1995 tragedy. 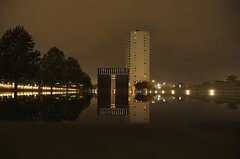 Acrosss the reflecting pool is the 'survivor tree', which miraculously survived the bombings and the fires which ensued. At each end of the pool is a large monument displaying the times 9:01 and 9:03. 9:02 was the time when the horrific event occurred. After the memorial we headed for Tulsa, Oklahoma. I thought we were rolling deep in Heather’s SUV, but Justin’s Denali was rollin’ real deep, maybe even rollin’ dirty. Cushy leather heated seats, lots of leg room, wireless internet and it even has a DVD player so we can watch our favorite movie: Earnest Goes To Camp. Justin and Brian took us to the center of the universe. It's this concrete walkway across train tracks in downtown Tulsa. The shape of the concrete walls make ones voice echo, but only in one spot, and only to the person speaking. Pretty cool stuff, if you're in Tulsa find the center of the universe and try it out. We were still in shock from the echo producing anomoly that we had just been introduced to when a figure stepped forward from the shadows. It turned out he was a local homeless poet named Wes who offered to write us a short poem. It's safe to say he earned a few dollars for this performance. Wow!!! That is one of the coolest way to spend your vacation!! I hope you reach your goal in 50 days! Good luck!!! wow.. I sounded real intelligent! OMG!!! I love the Center of the Universe!! And Wes is awesome!!! I hope you guys were as amazed by it as I am. P.S. Did they tell you the story behind the Center of the Universe??? they took you to the center of the universe?!?! man, they shoulda taken you to hell, yes thats right the center of the universe is just a few miles away from the pits of hell. well, in tulsa it is. if you guys ever have the urge to stop by our humble town again, ask around and have someone show you where its at. cool stuff.